Visit Marmot's Trestles 30 page. The Trestles 30 is a reliable all-purpose bag for everything from weekend camping to days on the trail. 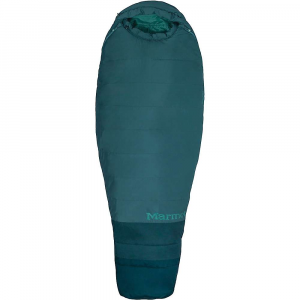 Made with Marmot's SpiraFil LT high loft insulation, wave construction and 3D hood keep you warm and comfortable, while a long list of features gives you everything you'd expect from 40 years of crafting sleeping bags. Marmot's best selling bag for years recieves a full overhaul. Now lighter weight and more compressible, the Trestles is the perfect bag for backpacking and trekking. 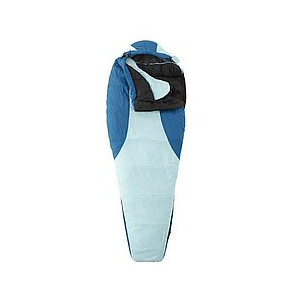 Marmot Trestles 30 Women's Sleeping Bag Synthetic Long Left Greenery/Deep Teal MAR0075-361157. The Trestles Women's specific fit is cut to contour to a woman's body and includes more insulation than unisex bags in critical areas of heat loss like the hood core of body and foot box. The Trestles also uses Wave Construction the warmest shingle construction available fitting extra insulation into these bags by creating an overlapping wave of shingles throughout the bag. These bags will keep you warm and dry in the wettest of environments. Classic trapezoidal foot box for more foot room. 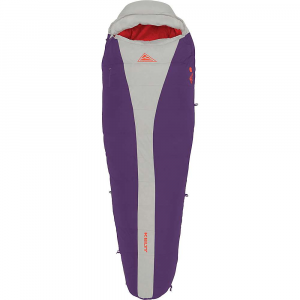 With synthetic insulation and a women-specific fit, the lightweight Marmot Trestles 30 sleeping bag is designed to stand up to cool, wet weather while backpacking, camping and kayaking.